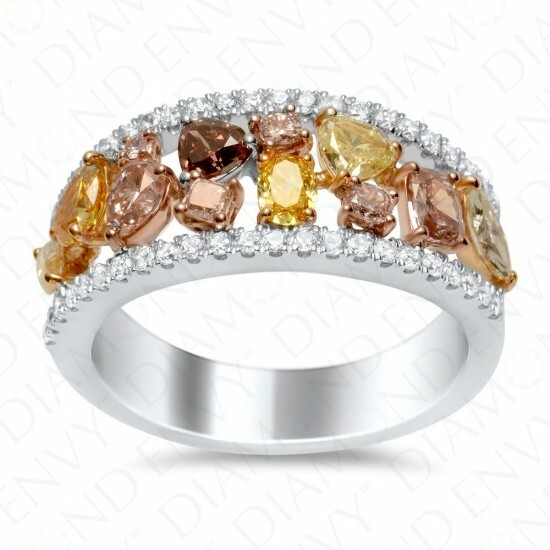 The exciting combination of diamond colors and shapes on this fancy colored diamond ring separates it from any other. Twelve multi-colored diamonds of varying brilliant cuts are artfully arranged between two rows of pave set white diamonds for a fun and unexpected look. Among the natural fancy colored diamonds are a beautiful and rare Fancy Light Yellow-Green diamond and Fancy Vivid Orange-Yellow diamond. Gold weight: 6.03 grams. This natural colored diamond ring is house graded.